Wow, this show just gets better and better. It was moving along nicely before this point, but the episode just sets it off! Everything happens this episode to the point were I am kind of wondering what more things will be revealed. The ending was so good! SO GOOD. For everyone who is watching this drama (who can find this drama) I would love to know what you think about it because it seems like this viewership is so tiny due to Netflix having the sub license. Netflix is releasing each episode a week late in some countries, but I am not sure how they are treating it in the US. I tried looking it up on Netflix, but I didn’t see it there. On Demand Korea also has the episodes. Everyone looks at the woman who showed up on the beach. All the evidence says that she drowned. JI and KD are checking out the scene while some townspeople are informing them of what usually happens. They say that this halmoni usually goes out to catch something at High tide and catch something. KD asks the woman if this halmoni used to be a woman diver. The son says, yes, she did that all her life. JI says there is a sharp scratch on her foot, perhaps this happened before she died. A woman holds up a crab and says that this may have done it. JI scratches himself and checks the wound with the woman’s, it matches. KD gets into the water where the woman was found, but JI ignores her. He asks where low tide and high tide are. Then he thinks about the math. It was today’s high tide, so she could have mistakenly stepped into the water, but her body should disappear. But if her body was there, then maybe she died after 4am, when it was low tide. JI compares KD’s feet and the dead woman’s feet. He thinks the body was moved. He stands up and asks where everyone was around 4am. They wonder if he is accusing them, but he says it is normal questioning. All the people say they have an alibi, but JI says he wants to do an alibi because something bothers him. The son is questioning it but the townspeople say to go ahead and do it. They take the body on a small boat with the rain pounding on them, but then KD sees something in the halmoni’s mouth, she takes it out and then they leave. But JI says they won’t be leaving with the body, they will be staying on the island. KD says she doesn’t want to be there, but JI says this halmoni died when she was trying to tell us something, so if it is a murder case then the killer should still be on this island. All the townspeople look guilty. JI calls the other police doing the autopsy, he wants to check the plankton levels in the lungs. Then he shows KD a picture he took of someone at night. He thinks the murderer might have been in the area. KD shows him what she found in the bodies mouth, she thinks it is a dying message. They see that it is a bible message, but JI thinks it isn’t anything big, that stuff only happens in movies like the Davinci Code. But KD says the serial killer used bible messages. Then they notice that this woman has a lot of gum. KD says you are supposed to chew a lot of gum and then put it in your ears to block the water from coming in, it is common knowledge. Then JI sees some white powder and wonders what all this powder is. KD says it is medicine for decompression from coming in and out of deep water. All the female divers take this, it’s common knowledge. Then JI sees a vase with a white heron on it. But the son comes in and says not to touch it. They wonder if it is expensive, but KD says it is Shamanism, it is about this god protecting the house. KD says she saw this in a comic. She asks if he or his mother went to church. He says there is no church on that island and his mother was very superstitious, she believed in all the shamanism gods and they performed ceremonies regularly. They have water for the kitchen god and fabric for the health god and hay for the house god. KD asks if there are any suspicious people around. The son wonders if someone killed his mother. She says she isn’t sure, but she is curious about his warning. Why did he tell them that? The son looks around and sees the other people, he says it is nothing to do with his mother and she will find out in due time. But then JI comes up and asks about the mayor. The son says he is an okay guy. JI looks at the bible verse and says that a person who was very away from the Bible, died while chewing on a bible verse. They think about the halmoni and the case. JI thinks the girl looked just like KD, but KD just says that she will look around some more, and leaves. KD brings JI a map of the island. She points to a church that turned into a nursing home, they decide to go there. But when they get there, they see that it is all burned to the ground. KD says it is common in the country to preserve shamanistic churches. She says she learned this at school. It used to be sacred. JI thinks that it becomes superstition if no one believes it anymore. But then KD starts to remember something. KD is in the middle with her eyes covered and she is holding a plant. The other kids are walking around her and asking about their future. Then they stop, and they ask her if the god/spirit came. She says yes. One girl lost her mother’s silver ring, asks her where it is. But KD doesn’t know where it is, she says to just wait. Then she starts to hear something. Little kid, little kid, can you see me? Play with me, play with ajusshi, hahahahahhaahaha. But a Halmoni comes and throws something on her. She tells the kids that they shouldn’t come here. The kids run away and the halmoni asks the girl if she wants to be a shaman, don’t do these things. But the girl says she told her not to play the other one, not this one. Kids do this all the time. The halmoni says other people can do this, but not her. Three ghosts came, if they come into your body then you will be in trouble. She puts something over the girl’s head and tells her that these ghosts are dead but couldn’t leave earth. Then we see some white legs in the distance behind the shaman church. KD snaps out of her dream with JI asking her questions. He wants to know if she saw a bear sound or something and tells him that they should leave. But she was about to tell him something about her bell. They keep walking and they stumble upon an expensive looking gate with security cameras. They go inside the gate and look around. Inside, it is a nursing home, but this is the place from episode 1. JI says this isn’t a normal place because they have so many security cameras around. Cut to a guard watching them from the security cameras. A man comes out and tells them not to be here. KD recognizes him from the city and they tell him that an old woman died so they are investigating it. JI asks why they have so many cameras. The man says it is because they don’t have doctors, so they need to know if anything happens right away. The man walks out, and JI notices his walking gait. He tells the man that they investigate people based on their gait because someone’s gait can be like a fingerprint. JI says he saw someone similar earlier. JI shows him the video on his phone. The man says it wasn’t him, he was there all night. So, JI says to check the CCTV. They check it and it shows that this man went out that night. JI wants to know if he killed that woman, but the man says he didn’t do it. They want him to tell them what happened, but he says he can’t tell them. He needs evidence. But JI says he has the evidence in his hand. The man tries to take it from him, but JI’s self-defense is too good so he puts the man in an arm lock. He tells him that he will have to see him again after the autopsy. Outside, JI and KD leave and KD wants to know what evidence that was. JI says it was just their ticket, he had it in his pocket. KD is impressed because his facial expressions didn’t change at all. Back at the coroners, we find out that the woman died in fresh water, not sea water. He tries to call JI and KD, but they don’t have a signal. They find out that someone cut the telephone line. JI thinks there are two or more people who might be behind this crime. Meanwhile, the man back at the church calls the mayor and the mayor tells him to just kill JI. Just say it was a mistake, he thought he was a hog, not a human. He hangs up and we see that the men are digging two graves. Cut to the man from earlier walking through the woods with a gun. JI and KD stop at a school and KD sees a little girl. But she is gone. JI says, there are no kids on the island. The name of the school is Gumin Hakyo (Peoples school), it is a very old name for a school in Korea which means that the school closed a very long time ago. KD and JI go inside and look around. Everything is very dusty. But then KD sees the little girl running, so she follows her. She runs outside and around the building, then she walks slowly to the side of the building is. The girl is there looking at the wall, she turns around and we see that it is her when she was younger, then the girl disappears, and we see the picture drawn on the wall. Inside JI is digging around for something and he picks something up off the ground. Outside, KD starts removing the vines from the wall in order to uncover the picture. Inside, JI picks up the cult cross and thinks that he has this somewhere…maybe — ! Outside, KD reads the names on the picture, Apollo, Byul, Popeye. Fade into a flashback of a little kid giving Byul some snacks, all stars. Inside the snacks, you might find stars, so it is a precious candy. She asks Popeye why he gives this star candy to her, it is the best part of the snack. Popeye says that he likes the fried noodle part more. She says he is lying and he says that it is true. She says her tears are also salty. Popeye says when he grows up he will open a supermarket and Apollo will be a cartoonist (Apollo is another name of a snack). All three of them share the snacks. Then they start to draw themselves on the side of the school. They write their names under their images as well. Back to the present, KD sees this, now she remembers it. She stares at it, so all of this was her memory? JI comes to her with the cross, he looks excited and worked up, he says this is from that church where the killer was hiding! Cut to the church, Pastor Wang is giving a sermon to everyone there with Chairman Do-guy and Candidate Han-ju in the audience. Prosecutor Ha-minis there as well, he is sitting next to Princess Ah-hyun. AH thinks that the pastor is a better salesman than her father (chairman Do-gyu). Pastor Wang continues with his sermon, he says his cross is 23 years old. AH comments on his shoes, how expensive do you think they are? $20,000. She says that is why people say this place is a cult. She asks HM if he wants them and he says he does. She says she can buy it for him but he says that the person suffering now will get gods praise. All of a sudden that man from earlier starts shooting at them with a shotgun. They pull out their guns, but there are no bullets in either of them. The man yells at them, why are they on the island? KD says that is a long-range rifle so either this man isn’t good at shooting or he wants to lead them somewhere. RUN! Back at the huge cult church. Someone gives 12billion won which is 1.2 million dollars. Everyone walks by and gives their offering. HM watches all of this and says that money is more powerful than human relations. Then we see a montage of all the money going to the back and getting put in boxes and then going in a car and getting driven somewhere and CRASH! The car hits something and all the money goes everywhere. The box is The Garden of Eden apples. The fruit of the tree of knowledge. HM watches everyone grabbing for the money in the street. Back at the island, KD and JI run from the shooter, but he catches them inside the church. JI tells him that they are police, this will be a big deal. If two policemen die then this island will be in big trouble, it will be a different scale if two police officers die. He says he doesn’t care, but then someone comes from behind him and grabs him, it is the meenbak owner. KD wants to know how he came there and he says that someone told him that this man was following them with a gun. The old ladies talk about what is going on, but then we see the same box of apples filled with money next to her. It looks like she is burying the box. Cut to JI and KD tying up this man in a shed. The mayor comes in and wants to know what happens, he plays like he doesn’t know what is going on and asks the man why he did that. The policeman calls them and tells them that the woman died in freshwater, not sea water. JI asks what the ingredients were in the water(?). The cop says he is busy with a money case in the street though. He gets off the phone. Then we cut to JI and KD changing their clothing to island ajusshi/ajumma clothing. It is a pretty funny moment, but then they sit and talk about the letter JI found in Apollo’s room. KD says that the nicknames were based on snack food. He wonders how she knows that and she says it is because the girl is her. She thinks back to her interactions with Apollo and him thanking her for remembering him. JI wonders, so she is the granddaughter of a shaman, that is why she has all these supernatural things? Ah, that is why it connects. KD thinks Popeye should know the most out of everything. JI wants to know why her father lied and KD thinks of the dream of her father trying to choke her. But she says that maybe something else is going on. She wants to leave right now though and go to the crime scene. The crime scene is the freshwater well on the island. They drink from the running water part, it tastes better than tap water…JI says that the minerals from this water were found in the halmoni. KD looks like she is about to be sick. JI says she was probably in the well, not the running water. KD finds a hair in the water and JI says it was probably done at dawn, so they didn’t have time to bury her. KD says they don’t have evidence, but maybe they will find some evidence here. JI wants her to put his head in the water, but do it professionally, not like a joke. She has to put his head in and not let him go even though he is suffering. KD wonders if it okay and JI says his body won’t be damaged with this kind of thing. KD is all like, okay…she relaxes her body and then pushes him in. It looks like JI didn’t think she would be so strong and struggles to get out. But she holds him in and says that he told her to do it! But the manages to get out and says that she should have gone on 3, not 1! JI tries to recover and thinks that something isn’t right with his body. Then we see them both walking back to the town, they are invited to eat with the old people again, so they run inside and JI tells them the tale about almost dying from the gunman. What he says is true, but the way he says it is exaggerated and hilarious. While JI talks, KD wonders if any of the women remember her. She starts scratching her arm, and one of the women says that she probably had an allergic reaction to one of the trees. JI moves his plate farther away from her (lol!). They want to know why they planted those trees there and they say that those trees repel people (poison oak). They don’t have any ointment, so they tell her to clean her skin well and then put some plants on it. That will cure her. They say goodnight, but when KD and JI walk off, the two women and the mayor change their faces. They want to know if they will send them back alive and the mayor says that what they said is true, this will become big if they kill them. KD goes to sit with the gunman and asks him if it is okay if he takes off his clothing? The man is like…no. But JI tells him that he isn’t that kind of person. Then we cut to KD talking to her father. She tells him that she will be back soon, and it looks like she wants to tell him something else, but she just tells him goodnight and to have good dreams. But then she asks her appa, who am I, after she hangs up the phone. Meanwhile, KD heard a bit of her conversation, but then he goes to dig up that plant to put on KD’s skin. But then he finds the apple boxes filled with money! He is like, whaaaaaat!!!! Cut to him giving KD a lot of plants. But then he comes into her room and sits. He tells her that actually, he found…. (he explains it all). They wonder what they are fighting here and he tells her that it is something big and they should perhaps do a little acting exercise together. The next morning, they participate in a shaman ritual. A woman is in all white and a ghost supposedly enters her body. It tells her to get the powder medicine. It looks like she is pretending to be the dead halmae. Her son tells her to stop doing the water diving and go to a good place. The shaman starts talking to him like the halmoni and says that she is leaving. But JI runs up to her, wait halmoni! You know me! You took my shoes! This is my first time to meet a dead person! Halmoni, just one questions, who killed you? Tell me, it is the guy that i captured right? Tell me! The son is shocked, who is it? But KD points to the son and tells him to take his clothing off, he should have the rash from the poisoned oak. Flashback of the son and the halmoni at the well. The son tells her to tie her hair and then he forces her head into the water. Then he starts to say a lot of bible verses, but the halmoni comes up, she wasn’t dead (she can hold her breath for a long time since she is a diver). She starts walking toward her son. She pulls a bible verse from the page and says she has to plug her ears first to jump into the water. He charges her and looks as if he will strangle her, but they cut away. But then KD says it is a halmoni over there? She points the shaman instrument at the house god and looks inside a jangtok, there is the bible in there. JI says that if this is true then the page should be shredded, and it should have her fingerprint. They walk back to the gunman and JI asks him why he came to the meenbak. Gunman says he was worried about halmoni. Why? KD says it is because you are the true son. It looks like everyone knew that, so why is the entire town acting like that? Rewind to JI and KD talking in the room. JI thinks that the gunman didn’t hit them on purpose. He pulls out something and shows it to JI. The names match from the gunman and halmoni’s things. They think the man at the meenbak is the second suspect, but they need to find the bible. They find it in the rice jangtok. They say that a big pile of cash came from a garden in 2011 and he found the same thing. KD pulls out the money and starts throwing it. But then KD starts to really hear a bell sound. She starts to turn into a shaman. KD tells the people to explain this to them, what is this money? But the man tells him to stop this, he has had enough with this play, this money is from selling their fish. KD tells them that this is all lies. She walks up to him and smells him. You made a lot of places to bury people. She walks around this man and tells him that he will be in there soon. He won’t survive this year. But KD continues. She tells one of the women that she prayed to one of the gods to have a son, she prayed a lot and burnt the house! She killed the husband! KD pints this white shaman instrument at her and looks at her intensely. The woman yells, gongsu is happening! Gongsu is when a dead persons’ will comes into the shamans’ mind and tells him/her their last wish. I am enjoying this one too! It’s a gem. I wish more people could watch it and I’m happy your recapping it. Fighting! This is one of our favorites on right now! 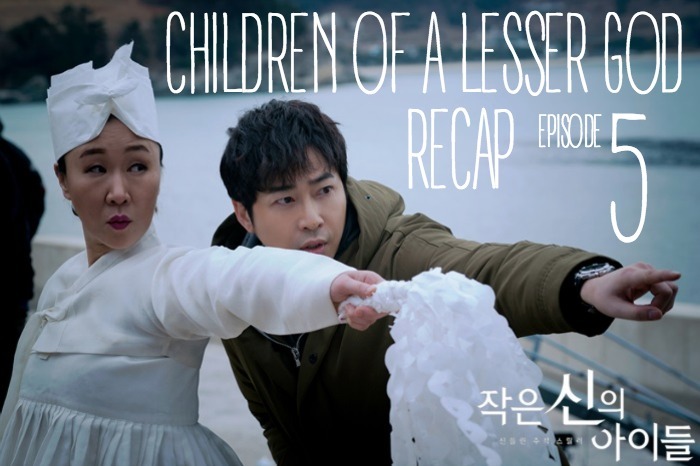 It is very different from other dramas but it falls in line with the kind of dramas Kang Ji Hwan usually makes. Oooh finally found another fan watching this! Yeah I agree, there’s barely anyone watching this drama atm because of the lack of eng subs 🙁 I’m managing to just scrape through thanks to Chinese fans subbing it. You mentioned Netflix having the sub license – what is it, and is that why no one is allowed to eng sub it? Yay! More fans watching COALG! I actually just heard that Netflix has it but I haven’t found it on Netflix yet. It is probably country locked and my country doesn’t have access possibly? I think that is why no one else is subbing it yet. They have to wait for Netflix to release it. Aargh. And we just need someone to sub it!! whats the title of music instrumental in this drama? Ooh, good question! I’ll try to find it. I just noticed that we don’t have a music list for this post. If I have time, I’ll try to make one. But i’ll try to find this song and post it on this comment.